HPE Switch 3800-48G-PoE+-4XG Layer 3 Switch - 48x 10/100/1000T PoE+ -portia (30w) + 4'x 10GBase-T RJ45 -porttia (PoE Budjetti 1080 W). 1x pinoamismoduli paikka. 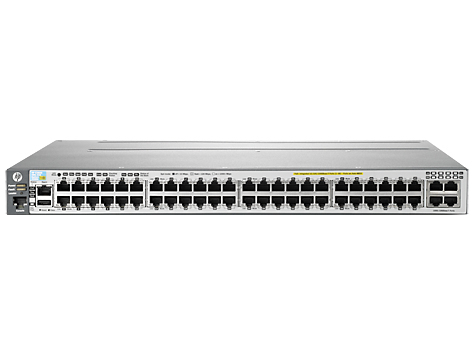 The HP 3800 Switch Series is a family of nine fully managed Gigabit Ethernet switches available in 24-port and 48-port models, with or without PoE+, and with either SFP+ or 10GBASE-T uplinks. The 3800 Switch Series utilizes the latest HP ProVision ASIC technology and advances in hardware engineering to deliver one of the most resilient and energy-efficient switches in the industry. Meshed stacking technology is implemented in the HP 3800 Switch Series to deliver chassis-like resiliency in a flexible, stackable form factor.